Have lots of photos taken with your cameras on a vacation, at a party, in a wedding ceremony, or else where? Wanna share the most precious moments with your family and friends? It seems to be a good idea to make a slideshow of those photos and burn the photo slideshow to DVD discs, so that you can send them to your family and friends as gifts. 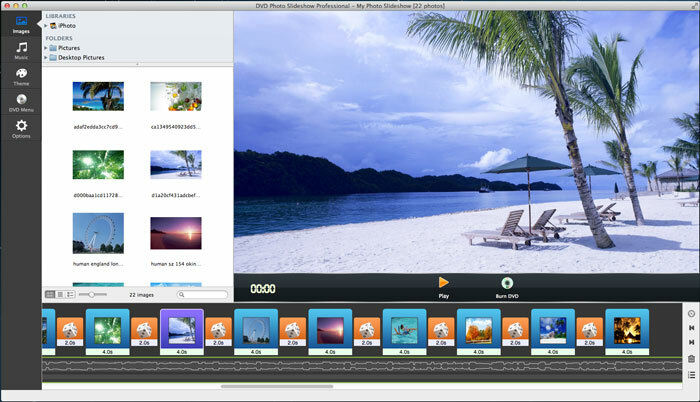 It is easy to create a DVD slideshow with DVD Photo Slideshow for Mac. This Mac slideshow DVD burner lets you make a slideshow of your favorite photos with your favorite music with ease. Besides, it lets you set a menu for the slideshow DVD. When the DVD is created and you start to play it on a computer or on TV, the menu helps you easily control the playing of the slideshow. You can also select a DVD menu theme to make birthday slideshows, wedding slideshows, Christmas slideshow, and more with ease. Now let me show how you can burn photo DVD slideshow with menu with DVD Photo Slideshow for Mac. In the Images tab, you will be able to browse all the pictures in your Mac. You can drag photos from iPhoto library or other folders in your Mac hard drive to the timeline. Switch to the Music tab, and you will be able to add music from GarageBand or iTunes library to the timeline. You can load songs from other folders in your Mac hard drive as well. A menu is an added bonus to a slideshow DVD. With this Slideshow DVD Maker for Mac, you can easily customize the menu for your DVD slideshow. There are 10 menu themes for you to choose from. Whether you are going to create wedding DVD slideshows, birthday DVD slideshows, or Christmas DVD slideshows, you can simply find the one you like most. Go to the DVD Menu tab, and you can set DVD Title and Subtitle, pick a DVD menu theme, and select menu background music for your slideshow. Press the Preview button, and you can check out the real effect of the DVD menu. 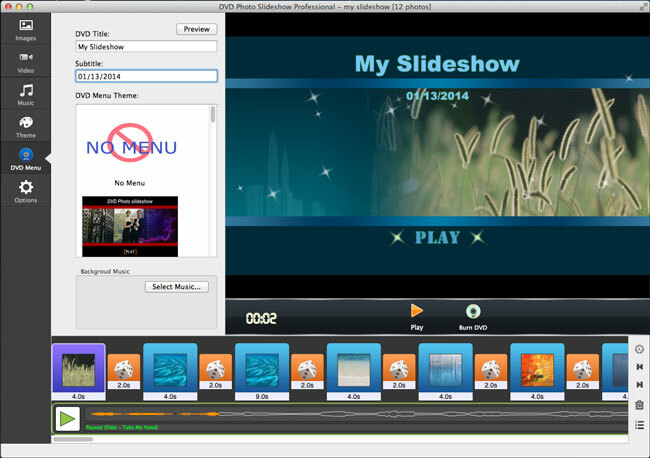 When the slideshow is ready, you can click menu Share and choose to burn slideshow to DVD. Then a DVD slideshow with menu will be generated within minutes. Note: To learn more about how to apply transitions, add background music, specify photo and transition duration, edit photo, set Pan & Zoom, and more, please refer to user guide of DVD Photo Slideshow for Mac.